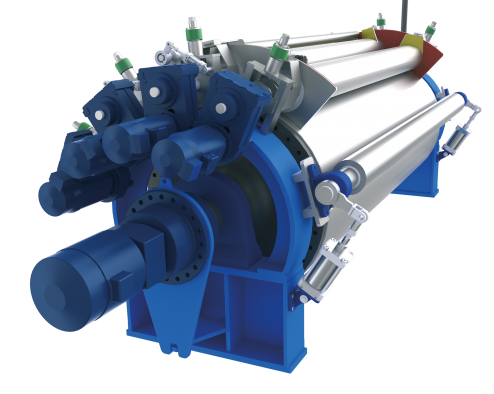 The Simon steam heated Drum Dryer is noted for its high thermal efficiency in the removal of water and/or solvents from a wide range of solutions, slurries and suspensions. The ratio of steam consumption to evaporation can be as low as 1.2:1 and seldom more than 1.5:1. Heavy duty cast iron or fabricated carbon steel construction. High grade cast iron, engineering hard chrome plate or hard chrome/nickel plate on cast iron. Carbon steel or stainless steel clad cast iron with pneumatic operation as standard. (Oscillating knife mechanisms optional). Sheffield steel, special stainless steel, or stainless steel blade holders tipped with beryllium bronze for custom applications. Provided where necessary, faced with phenolic resin or similar. Are used for drum drying starch based materials or pastes. Cast iron, cast iron chrome plated or stainless steel, driven by pinions from main drive spur gear wheel, or by individual shaft mounted geared motor units, available with internal cooling or heating as required. All feed rolls and twin (double) drums fitted with spring loaded safety gear. Vapour extraction hood, total dust tight, nitrogen atmosphere capable, or full vacuum casing. Side and cross conveyors, traversing feed gear, automatic feed control, product breakers. Milk products, baby foods, breakfast cereals, fruit and vegetable pulps, starches, spent yeast, chemicals, biologicals. Single Drum Dryer with Applicator Rolls The wet product is applied to the drum by means of applicator rolls. According to the number of the applicator rolls used the layer formed on the drying drum is thicker or thinner. This arrangement is suitable for the processing of pulpy or pasty products. Typical applications are: Cereal based breakfast foods, Baby-food products, Pre-gelatinised starches, Fruit pulp and pastes, Potato flakes. Twin Cylinder Dryer with Nip Feed The material to be dried is pumped, either directly or through spray nozzles, into the nip formed between two drying drums. This is the oldest and simplest form of drum dryer. The thickness of the product film may be varied by adjustment of the gap between the drying drums or cylinders. Typical applications are: Drying of Spent Yeast, Milk products, Detergents, Dyestuff manufacture. Single Drum Dryer with Applicator Roll This is a more specialised type of drying, for example in the Chemical Industry. The applicator roll is located underneath the drum dryer and dips into the product. A liquid film is then transferred to the drying drum. Typical applications are: Animal based glue, Gelatine, Pesticides. Dip Feed Drum Dryer One of the most basic forms of the drum dryer, where a film of the product to be dried is picked up on the surface of the dryer drum as it rotates through a feed tray mounted below. The feed tray may be cooled or fitted with a re-circulation system to prevent overheating or settling out of product from suspension. Typical applications are: Drying of cereals, Spent Yeast.